Louis Bennett, Jr. and others wait next to plane at Sheepshead Bay. 2. Flooded Area of North Alderson, W. Va. 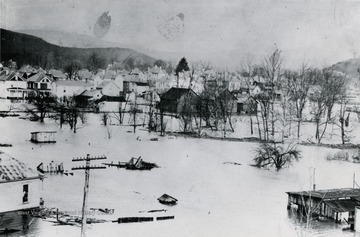 Flooded Area of North Alderson, W. Va. Flood waters covering housing portion of North Alderson. 3. Mooney and Ernest Store in Morgantown, W. Va.
Mooney and Ernest Store in Morgantown, W. Va.
4. Company L Leaving Morgantown for Mobilization, Morgantown, W. Va.
5. 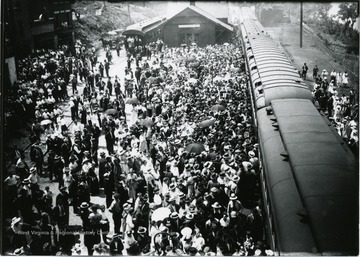 Crowd at Morgantown Railroad Depot, Morgantown, W. Va. 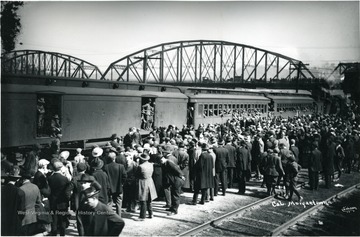 Crowd at Morgantown Railroad Depot, Morgantown, W. Va.
6. 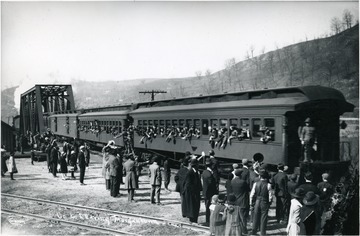 Company L Leaving Morgantown for Mobilization, Morgantown, W. Va.
7. 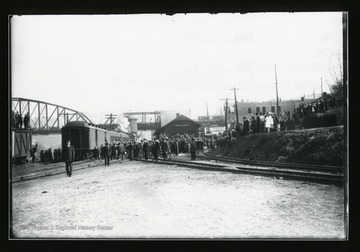 Company L Leaving Morgantown for Mobilization, Morgantown, W. Va.
8. Military Parade at Camp Greenbrier, Greenbrier County, W. Va.
Military Parade at Camp Greenbrier, Greenbrier County, W. Va.
Campers in uniform lined up for the military parade. 9. 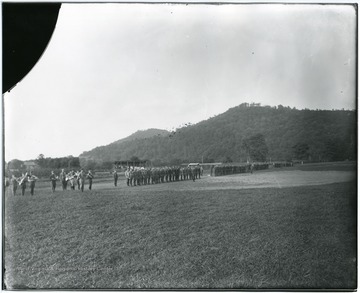 Crowd Gathered to See Off World War I Draftees, Hardy County, W. Va. 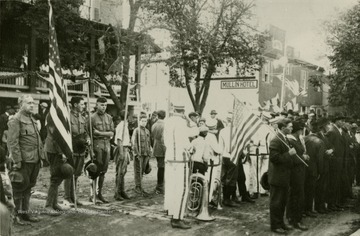 Crowd Gathered to See Off World War I Draftees, Hardy County, W. Va.
10. 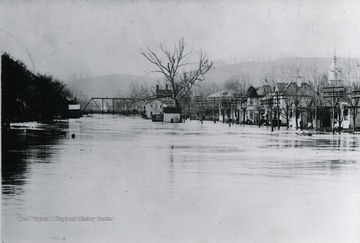 Flood, Weston, W. Va.
11. 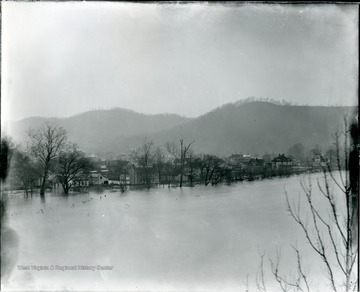 Flood Waters at Weston, W. Va. Flood Waters at Weston, W. Va.
A view of the flood and its damage in Weston. 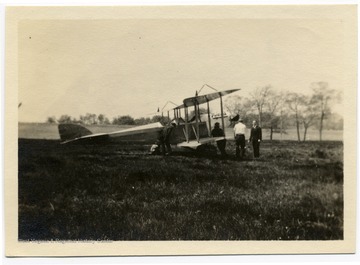 Photograph given to Dr. Core by A. C. Shively, dec'd. 12. 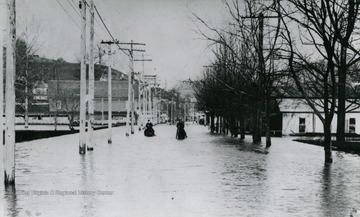 Horseback Riders on a Flooded Street in Weston, W. Va.
Horseback Riders on a Flooded Street in Weston, W. Va. 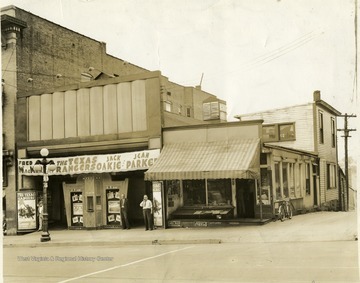 Photograph given to Dr. Core by A. C. Shively, dec'd.